HE’S ALWAYS BEEN an odd character, has Wayne Rooney. At times he has been the perfect blend of brute force and subtlety; like a chisel and brush of some renaissance artist. More often though, his artistic temperament has got the better of him. Hammers flail, dummies are thrown from prams and new dodgy hairpieces are installed as if nobody will notice. From an early age, if Rooney cared seek to advice from pundits, he has been told ‘you wouldn’t be the same without that mean streak’. Now, that mean streak has left him, and he looks all the better for it. Counter-intuitively, the return of his schoolboy bête noire to his life has taken the fight out of him. On the field these days, Rooney is eerily calm. The arrival of David Moyes has sent Rooney into a melancholic spiral. Like Jesse Pinkman after stumbling on the truth about Brock, Rooney is listlessly drifting around Manchester without much care of what is around the next corner. Gone is the fiery temper, the rash tackles and the woefully over-hit shots – all that’s left is natural talent. It turns out he has been unwittingly sabotaging himself for years. There’s a little bit of Wayne Rooney in all of us. Like when we put our faith in Paul McShane at the start of the season, when we trusted Jose Mourinho to make peace with Juan Mata and when I rashly and angrily exited PremierLeague.com without hitting ‘confirm team’, thus leaving the star men sat collecting splinters. We can just hear Tony Cascarino analysing the behaviour now; ’well, he’s a street-fighter. If you take that hot temper out of him you wouldn’t have the same player’. The lesson is, don’t try too hard and don’t over-think yourself. Let your natural Fantasy Managing skill-set shine through organically. Not like a kid playing in a park (Rooney again), but like an overgrown kid with an odd padded protective headband who has had his demands continually denied. So, the aloof side of us has sliced Ashley Williams out of the team and flicked Dejan Lovren into the back three in his stead. Both men have three home games in the next four, however, with Williams carrying a minor knock and Arsenal crossing the Severn today; I’m going with Lovren as Southampton’s games (Palace, Swansea and Fulham) do not have the added distraction of the Europa League as punctuation. 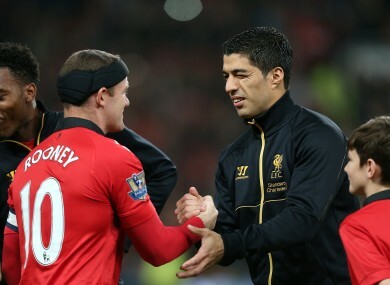 As for Rooney, well, I couldn’t put him in the team. He’s too zenned out, he’d drive me mad. Master and apprentice: Where did it go wrong between Mourinho and Villas-Boas? Email “Diary of a Fantasy Gaffer: Rooney finding life's balance at rock bottom”. Feedback on “Diary of a Fantasy Gaffer: Rooney finding life's balance at rock bottom”.